At Black Swamp Bird Observatory where I work, much of what we do focuses on the science of bird migration. But an equal portion of our mission is helping people fall in love with birds by introducing them to the miracles of what these winged wonders can do. We experience these miracles nearly every day, both in terms of scientific discoveries, and in seeing the joy wash over the faces of students when they see their first Blue Jay or Yellow Warbler up close at one of our school programs. But it isn't just the visitors to the Observatory who are moved by these encounters with birds. Even for the most seasoned researcher, migratory birds still have the power to spark an emotional response. Take BSBO's Research Director Mark Shieldcastle, for example. Mark has been studying migratory birds for nearly 40 years. He has seen some of the coolest birds on the planet, banded many of them, and watched the sun rise over the marshes of northwest Ohio an enviable number of times. You'd think by now he would have seen it all, right? But a return visit from a very special bird this fall was enough to inspire a heartfelt essay from this veteran scientist. Imagine this, your summer home is in the far north, maybe Alaska; your winter home is somewhere in the jungles of South America; and you rely on a special beach ridge in Ohio for the critical stopover connection between the two. You visit all these places, not by airliner, but by your own wing power. During fall migration, you spend 80+ hours with nothing but open expanses of ocean beneath you, longing for that first glimpse of terra firma. And you do this each autumn, for at least six years, guided by the primordial instincts that have obviously served you well. And today, five years exactly to the day of your first visit, you return to one of this continent's most important stopover sites, to the astonishment of human friends from long ago. What stories you could tell us. What stories you DO tell, since you are wearing our band. 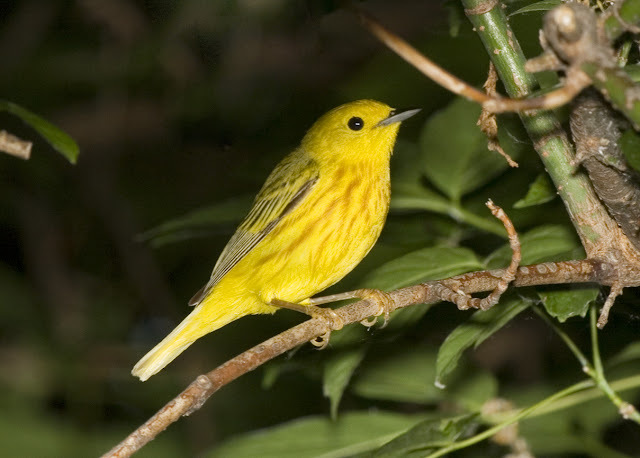 You are a Blackpoll Warbler, a true miracle of migration, first meeting the strange creatures that placed this bracelet on your leg on September 13th, 2006, calling you an adult male, and giving you an identity as number 2400-42807. And today, most certainly in your twilight years, on September 13th, 2011, you have returned, nearly to the exact spot we encountered you all those years ago, to teach us about the extraordinary feats that even the smallest birds can accomplish, and to prove to us that miracles can—and do—happen. The 500,000th bird banded by Black Swamp Bird Observatory. At BSBO, we thought that no Blackpoll Warbler could be more significant to us than the one banded by our research team in the fall of 2009—a bird that represented the remarkable milestone of our 500,000th banded bird. But this fall's returning champion has taken a very special place in our hearts. We estimate that this bird, weighing less than an ounce, has traveled at least 50,000 miles in its lifetime, a significant portion of those miles over the open ocean. 50,000 miles ... on your own wings. And then a tiny bundle of feathers stops by during an extraordinary journey that we can scarcely even imagine, reminding me that my job is easy by comparison. Inspiring me. Motivating me. And relighting that fire within that brought me to do this work on behalf of the birds in the first place. As we begin a new year, let us all remember the bird that lit the fire within us. Let us all remember the joy, the wonder, the excitement, and the peace that birds bring to our lives. And most importantly, this year, please remember to give back to the natural world and support habitat conservation in any way that you can. Kimberly, awe inspiring post! Thanks for all you do for the birds and for your great enthusiasm in sharing your passion with others. You make a positive difference everyday! Fabulous post filled with heartfelt words and beautiful photographs! Amazon river Basin in Venezuela the northern coast of South America. It's about an 80 to 90 hour journey, during which they will beat their wings three to four million times; they will have no rest, no food, no water. If they touch the water, they're dead. 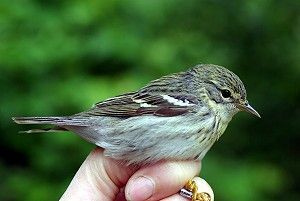 They also fly at much higher altitude where there is less oxygen accounting for their ability to withstand the low levels of oxygen available at such altitudes, the blood of blackpoll warblers is characterized by two specialized adaptations. The oxygen-carrying capacity of the blood is enhanced by a high concentration of red blood cells and Secondly, instead of one form of hemoglobin in the red blood cells as is typical in non-migrants, they possess two forms of hemoglobin which differ in their oxygen carrying and releasing capacities. This guarantees an adequate oxygen supply over a wide range of altitudes and allows birds to adapt rapidly to varying levels of oxygen availability. Thank you, everyone. We will never forget this remarkable little bird! We ever fully appreciate the stamina these birds possess, nor the importance of conserving all of the habitat needs of migratory birds. It's not enough to protect the breeding grounds and wintering grounds. We've got to protect stopover habitat as well. Thanks for reading my post and taking the time to leave a comment! I really appreciate it! Fantastic post! 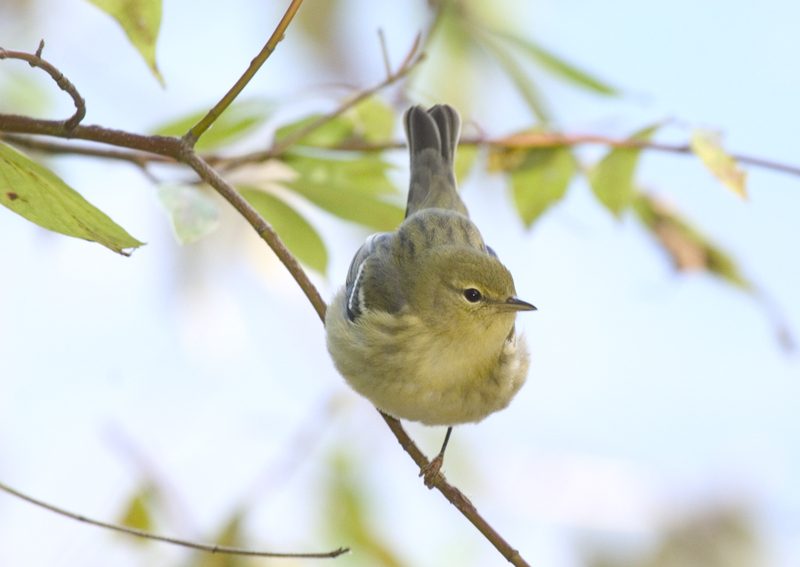 Wonderful photos of Blackpoll Warblers. I was banding at Raccoon Ridge Bird Observatory in Layton NJ in the early '80's and I had a similar experience. A pair of Common Yellow-throated warblers where caught two years in a row. When I saw on our records that I had caught them the year before it was wonderful. They were summer residents in the area.